We are two fun-loving and creative moms who live in the great Northwest. We are both married to supportive husbands and spend our days raising three children each, of varying ages, with all the carpools, dinners on the fly, and special moments along the way. 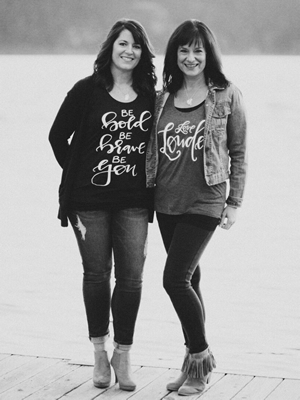 Fueled by friendship, laughter and grace, we forged into the world of hand stamped, personalized jewelry and have never looked back! We feel so blessed every day to be able to make special treasures for you that reflect each of your unique stories. Our favorite part of our business is being able to hear the meaning behind the necklaces we make, whether it is to celebrate the joys in your lives, bring healing during difficult times or give a gift just because. We LOVE what we do and often find our cupboards bare because we would much rather be metal stamping than grocery shopping. Work should always be this much fun! *** Our name, As You Wish, comes from the arguably classic movie "The Princess Bride" in which the hero, Westley, responds "As You Wish" to the farm girl, Buttercup's every request. She soon realizes that what he is actually saying is "I love you". We hope each piece purchased will help express love to the wearer... the world can always use a little more of that.